With a thrilling view of the Columbia River as it winds through its gorge toward Portland and the Pacific Ocean beyond, the White Salmon house commands attention. Mt Hood to the south is just out of sight, but to the east are the forested foothills leading up to more volcanoes in the Cascade chain. The 1,900 square foot, three bedroom house is designed to stay out of sight. 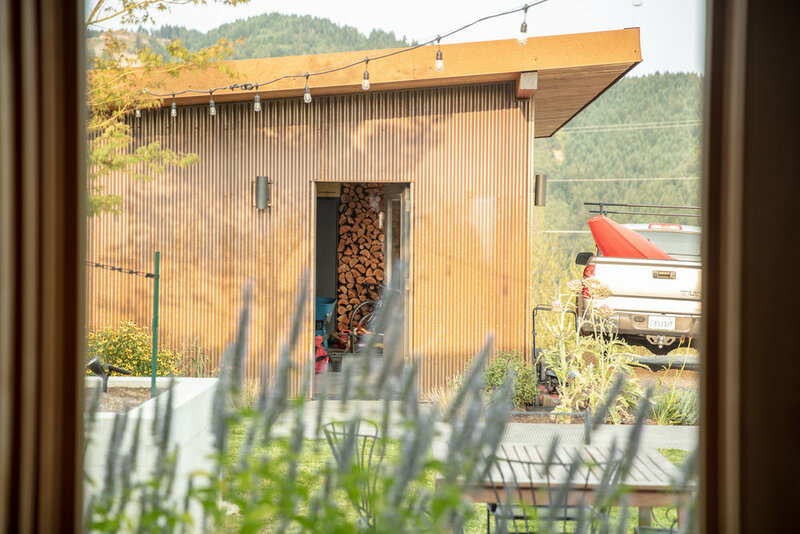 Its one story volume rises gently to the south in one long angle, with its muted colors of rust, charcoal and natural cedar blending into the landscape. The directive from the owners was to create something special, lyrical and durable within a strict budget, so close collaboration was essential. The owners, both skilled kayakers, helped develop a plan that is both practical and poetic. The interior axis from entry to the view side is interrupted by a “rock in the steam,” which is actually a utility room cedar-clad. The main spaces of the kitchen, dining, living room, and main circulation spine pivot around this object, just as a kayaker would pivot around an obstacle. Not only does this give the plan interest and energy, it also helps organize the space. The winds are famously fierce in the Gorge so the landscape is divided between a sheltered east entry courtyard, defined by the house and garage, and the wide open views of the Gorge side.